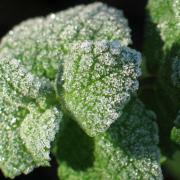 Protecting your plants ahead of potential frost or freeze will decrease chances of damage. ~Apply a 2 inch layer of mulch around your shrubs and hardy perennials. ~Cover your tender perennials with a sheet or plastic being careful to remember to remove it in the morning. ~Bring tropicals and houseplants inside to a heated environment. ~Turn off all faucets and hoses then drain completely. ~Please shelter and protect your pets. Now you can relax and cozy up by a warm fire knowing all will be well come Spring in the garden!